Praised by the New York Times for its “incisive, agile strength,” Downtown Voices is a semiprofessional choir made up of volunteer singers from the New York metro area and members of the Grammy®-nominated Choir of Trinity Wall Street. Directed by Stephen Sands, Downtown Voices’ first two seasons included performances featuring the works of Beethoven, Alberto Ginastera, Benjamin Britten, James MacMillan, Philip Glass, and a large-scale commission for the 250th anniversary of St. Paul’s Chapel, Spire and Shadow, by Zachary Wadsworth. Downtown Voices' third season included similarly ambitious programming. In November 2017, the choir presented Rachmaninoff's All Night Vigil and in December, a Christmas program. 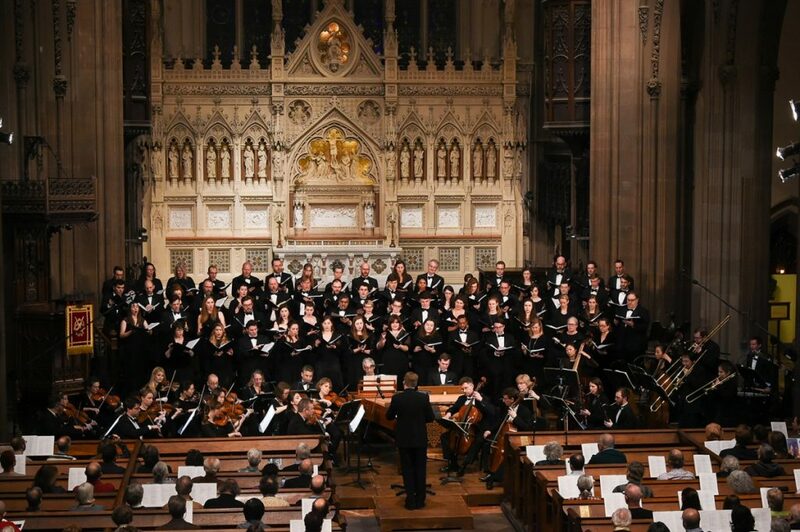 In the spring of 2018, Downtown Voices performed a concert of double choir masterworks, Bernstein's Chichester Psalms and the Brahms Requiem. Downtown Voices is at St. Paul's Chapel. Downtown Voices updated their cover photo. A lovely recap of our carol concerts this weekend!